Centipedes are dorsoventrally flattened creatures. Their bodies are divided by well-defined, flattened segments. On each segment is a single pair of legs, which means that individual has an odd number of leg pairings ranging from 21-23. To ward off potential predators, the rear-most legs are spiny and sharp. The front legs of the centipede are modified into venom-bearing fangs (maxillipeds) used in hunting for food. Mandible are also present for seizing and killing prey. They typically feed on small invertebrates such as crickets, worms, snails and even small vertebrates such as lizards and mice. They have long, jointed antenna for sensing the environmental surroundings. Centipedes have simple eyes or no eyes at all since they are nocturnal creatures. Respiration is conducted through the use of spiracles. Reproduction is executed through the male spinning a silk pad with sperm on it. The female must then pick up the sperm and lay her fertilized eggs. Centipede species inhabit tropical and subtropical forests in northern South America. Since they have no waxy covering on their cuticle, centipedes are restricted to humid environments amongst soil, leaf litter and rotting wood. The centipedes veracious feeding habits are beneficial to farmers and gardeners with pest problems. However, the poisonous bite of certain centipede species can seriously wound a human. Meshew, Catherine. "Scolopendra gigantea". Animal Diversity Web. 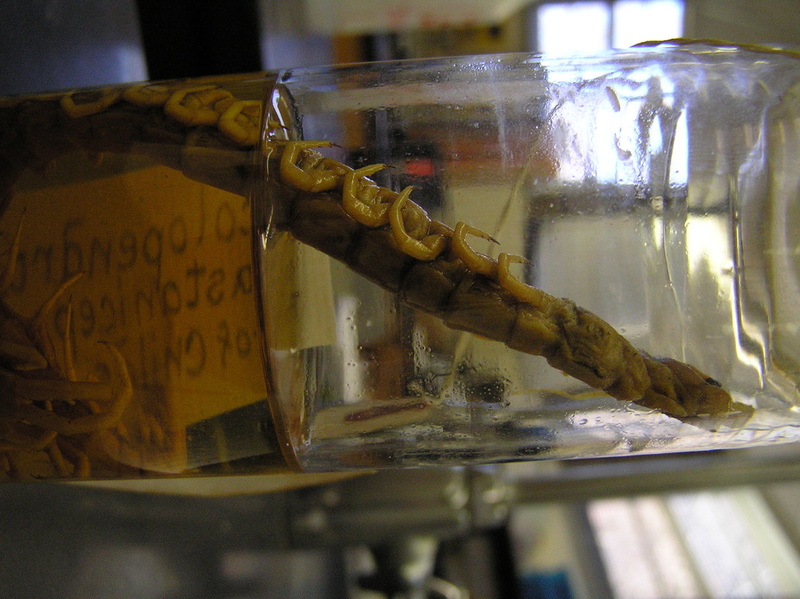 Retrieved from: http://animaldiversity.ummz.umich.edu/accounts/Scolopendra_gigantea/.